One of the wildest experiences you can have when travelling the world is getting to see local wildlife up close and personal. Zoos and aquariums can be a great way to see a wide variety of animals, but sometimes there is an even greater adventure out there waiting. We have gathered together 10 of the best animal encounter vacations you can plan today. It is very important to note that some tour companies who offer animal encounters do not care for the welfare of the animals. All of the excursions we feature are responsible, and this list will be updated if any of these activities no longer meet that criteria. Churchill Wild operates four remote, fly-in ecolodges in Manitoba, Canada. Two of their lodges, Nanuk Polar Bear Lodge and Seal River Heritage Lodge are members of the esteemed National Geographic Unique Lodges of the World collection. All four of their lodges are remote and their tour packages include transportation to Winnipeg, then Churchill, and finally a scenic flight to the lodge. 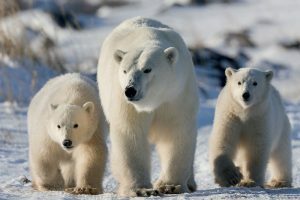 Between the four lodges, Churchill Wild offers 9 unique polar bear safaris. All have a chance to see the Northern Lights and many polar bears, as well as a wide variety of arctic wildlife. Aside from polar bears you can see Beluga whales, wolves, black bears, moose, caribou, foxes, and hares. Tour packages range from 7 to 11 days, and start at $10,000 CAD per person, although that is almost all inclusive. The season lasts from July to November each year. 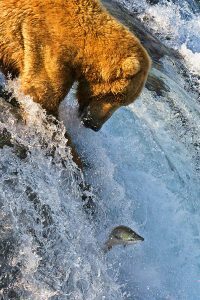 Katmai National Park and Preserve is a 4 million acre park filled with volcanoes and a wide variety of Alaskan wildlife. Most famous of all the wildlife in the park is the Alaskan Brown Bear. Every year in July and September hundreds of bears flock to the Brooks River to feed on Sockeye salmon. The park is only accessible by float plane, landing at Lake Brooks Seaplane Base. Flights are available from Anchorage, Homer, King Salmon, Kodiak, and a few other towns in Alaska. Lodging options in the park are limited to a few lodges or camping. Brooks Lodge is the most popular destination in the park, and the best place to bear watch. The National Park Service even has a number of webcams setup, so you can bear watch from your home. For more Alaska adventure ideas, check out our review of our first Alaskan cruise. When visiting the Everglades one of the most popular wildlife tours is taking an airboat ride. Unfortunately, the loud and rough airboats can have negative impacts on the local wildlife. As a result, the National Park Service has been instituting restrictions on the number of airboats and where in the park they can go. 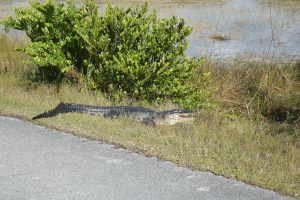 If you want a chance to see the famous alligators of the everglades up close while maintaining the peaceful atmosphere, your best bet is the Shark Valley Trail. Shark Valley Trail is a 15 mile paved loop with a number of walking trails and an observation tower. You can take a tram ride, rent a bike, or walk the trail, all while in the company of hundreds of alligators and a wide variety of birds. The trail is flat, and a very enjoyable experience no matter how you choose to see it.